Sometimes it's necessary to clear the plans for an entire day. You have the option to simply clear the day and leave the rest of your plans intact or clear the day and bump future plans back by one day. When you are in the weekly view, you'll see a cog icon next to each of the day names. You can click on that icon to bring up a menu of options for that day. 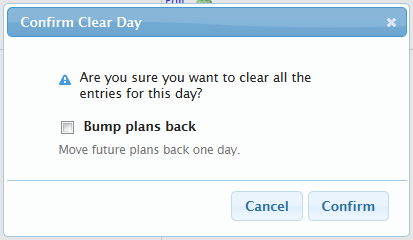 Select "Clear" and then you can choose if you want to "Bump Plans Back" to move your plans backwards. If you clear a day accidentally, you can undo it by clicking the "Undo" link that appears at the top of the page (below the planbook title). See our article on Bumping a Day's Plans- Backwards for more information.